Henry VIII – King of England from 1509 until 1547 – is one of the world’s most recognisable figures, remarkably familiar considering he predates photography, film and social media by centuries. The Art Gallery of NSW owns a portrait of the Tudor king but until recently we knew little about it. Was it painted during Henry’s lifetime, and who painted it? Some of the artwork’s deepest secrets have now been revealed, following a major research project using cutting-edge technologies. ‘Our’ Henry was examined in the light of work undertaken at the National Portrait Gallery (NPG) in London as part of the Making Art in Tudor Britain project. 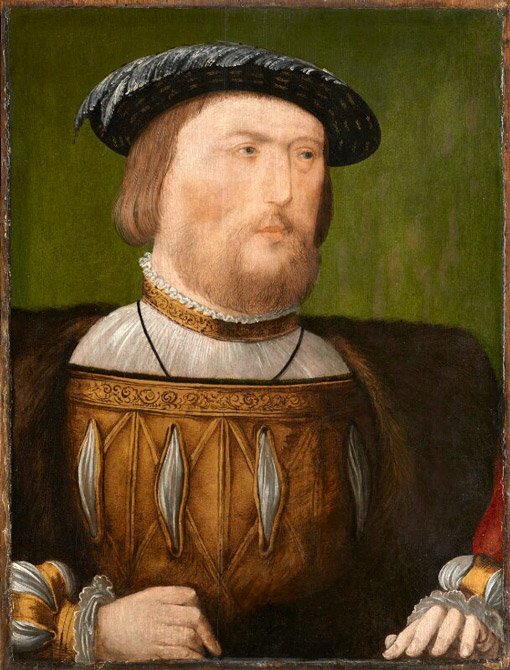 It had been identified as belonging to a group of Henry VIII paintings that share many similarities but differ in the details of the costume, position of the hands, and the measurements of the panels on which they are painted. In all the portraits of this group Henry has a reddish-brown beard which reportedly ‘looked like gold’. He wears a linen shirt with a circlet of gold braid at the neck and his shoulders are covered by the fur collar of his outer garment. His black hat is topped by a white ostrich plume. His head and body are turned slightly to the right, and he places his hands on a ledge (or cushion) in front of him. In all but one of the group, he appears to be aged in his mid-forties, shortly after he was declared the ‘supreme head’ of the Church of England. The exception is a long-haired portrait from the NPG in which he might be younger. Within the group, there are three portraits that show a particularly close relationship: one from the NPG, one from the Society of Antiquaries, London and ours – the latter two are almost identical. In these portraits, the king wears a blackish jacket slashed to reveal a gold lining, his doublet is red with a satin-like finish and the gold braid around the neck extends down the front of his shirt. Henry’s features seem curiously small and the eyes, nose and mouth give the impression of being compressed into too small an area of the face. The ridge of the nose is close to vertical. But why are these paintings so similar, and what significance does that have? We’ll be exploring that in our next Henry VIII post. 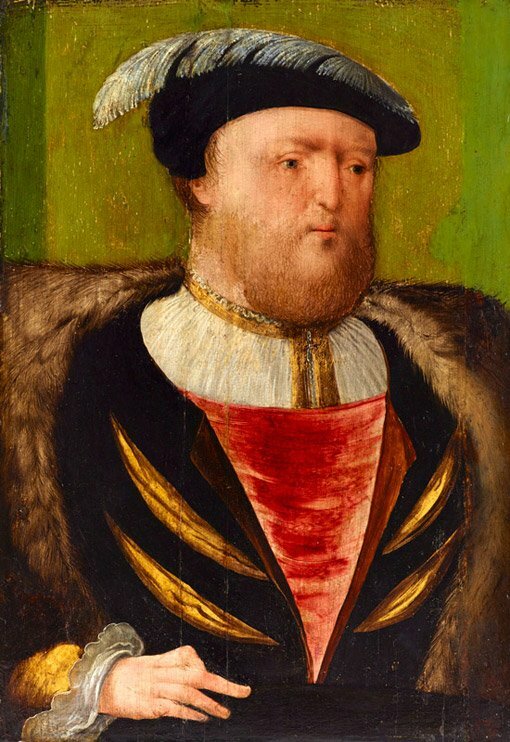 The Gallery’s Henry VIII portrait is on display from 12 May to 9 September 2018 in Henry VR.